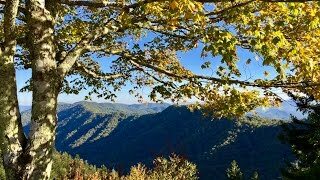 On a Mount LeConte view private lot! You’ll have no regrets staying at In the Mood Gatlinburg Cabin during your next family vacation or romantic getaway. This Smoky Mountain cabin is also a great lodging destination for couples vacationing together. The newer 3-story log cabin has a loft master bedroom, lower main floor bedroom, two gas stone-fronted fireplaces, a huge wrap-around covered deck, and a bonus lower level game room. The views of Mount LeConte from the living room and deck area are stunning from this very private setting. The spacious living room with cathedral ceilings, gleaming wood planking and floors, a stone-fronted gas fireplace, comfortable leather furniture, and one of the three TVs in the cabin create a perfect spot for relaxing. The wraparound deck has a patio dining table, benches, traditional Appalachian rockers, and a 4-person hot tub where you can take in all the views. The main floor bedroom has a king bed, a private bathroom, and it’s own TV. The loft bedroom has a king bed, romantic in-room Jacuzzi tub, an ensuite half-bath, and its own TV. The lower level contains an amazing game room complete with a pool table, TV/DVD/stereo, full-size arcade game table, its own stone-faced fireplace, couch, wet bar/sink/mini fridge, and two bistro tables. Free WIFI is available too. This Smoky Mountain cabin is all suited up for maximum family fun! The fully equipped kitchen has a refrigerator, stove/oven, microwave, dishwasher, coffee maker, toaster, dishes, glassware, silverware, cooking utensils, and cookware. A washer/dryer is also available for your use. The dining room table seats four comfortably with its own lovely views. Cook outside on the charcoal grill and dine alfresco on the deck patio furniture while you watch the sunset. Location, location, location! Beautiful mountain views and privacy, yet just a 5- minute drive to downtown Gatlinburg, make this a Smoky Mountain getaway with the best of both worlds. Picture yourself on a family vacation, romantic weekend, honeymoon, anniversary, or vacationing with your best friends. This cabin has spectacular views, bedrooms on separate levels for privacy, two fireplaces, three TVs, and a game room decked out for entertainment. Lounge in the 4-person hot tub on the deck and take in all the view of Mount LeConte. You don’t NEED to go into Gatlinburg with your own game room complete with pool table, wet bar, TV, gas fireplace, and arcade game - there is plenty to do right at the cabin. But bring your fishing gear, because there is a fishing lake nearby. Do you enjoy collecting? Then a trip into Gatlinburg to the Salt and Pepper Shaker Museum is a must - only one of two shaker museums in the world! This collection of over 20,000 pairs of shakers has examples from the 1500’s to the present. Your museum curator will educate you on the history and use of salt and pepper shakers, so you too can be an expert on the topic. Here’s the perfect place to purchase your own new set of salt and pepper shakers as a special memento from the trip and your spectacular stay in the Smoky Mountains. Set them on the table of your Tennessee vacation cabin and let them soak in all the ambiance. When you use them back at home, you’ll remember all the fun times at the cabin. Visit the Nantahala Outdoor Center to plan a guided rafting trip down the Pigeon River at your own experience level. You can also fish, hike, zip line through the forest, inch yourself up an indoor climbing wall, or use the children’s play area with swimming rope bridge at the Center. This is a great destination for exciting family outdoor fun. Afterwards, you can shop for your own outdoor gear at one of their three stores. When you return back to your Gatlinburg cabin, you will certainly be in the mood for relaxing in the deck’s hot tub or Jacuzzi bathtub. Nightly rates range from $155 to $230, plus taxes and fees.